For excellent deburring, edge blending and surface finishing of hard materials like carbide and ceramic, count on the flex hone tool from Brush Research Manufacturing. Made from resin bond diamond crystals, our Diamond Flex-Hone is designed for use on any cylinder from 4mm up to 20mm. This cylinder hone is an innovative approach to surface finishing and deburring of tough applications. We know that when you use our flex hone, you'll be satisfied with the results. For a PDF brochure of our flex hone product click here. 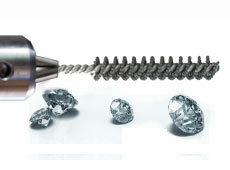 Need Help Selecting A Diamond Flex-Hone®? Tool diameter is determined by the nominal bore size in which the tool is to operate. The Flex-Hone® tool is always produced and used in an oversized condition. The degree of oversize creates a soft cutting action. For example, a 1" Flex-Hone size is ordered if a 1" bore is to be finished and the tool is provided oversized. If the bore size is between standard Flex-Hone sizes, the next larger standard Flex-Hone should be selected. For instance, if the nominal bore is 1.093", then the 1-1/8" Flex-Hone is ordered. Diamond abrasive is supplied and rated using a MESH scale, not a grit scale. As such the numbers do not directly equate to the grit scale rating of our other abrasives. 170/200 diamond is approximately equal to 180 grit capable of producing finishes in the range of Ra 30-40 (.7 - 1.0 Micrometer). 800 mesh is approximately equal to 400 grit capable of producing finishes in the range of Ra 10-20 (.3 - .6 Micrometer). 2500 mesh is approximately equal to 800 grit capable of producing finishes in the range of Ra 3-10 (.05 - .2 Micrometer).